1 In the beginning was the Word, and the Word was with God, and the Word was God. 2 He was with God in the beginning. 3 Through him all things were made; without him nothing was made that has been made. 4 In him was life, and that life was the light of men. 5 The light shines in the darkness, but the darkness has not understood it... 10 He was in the world, and though the world was made through him, the world did not recognize him. 11 He came to that which was his own, but his own did not receive him. 12 Yet to all who received him, to those who believed in his name, he gave the right to become children of God— 13 children born not of natural descent, nor of human decision or a husband's will, but born of God. 14 The Word became flesh and made his dwelling among us. We have seen his glory, the glory of the One and Only, who came from the Father, full of grace and truth. I love the affection and intimacy of the Gospel of John. I think none of the other disciples could have so eloquently or so beautifully described Jesus. I love the description of Jesus as the Word; such a powerful perspective, and such imagery it invokes! I am reminded of the Creation, which God the Father spoke into existence. The emanance of that which is spoken is the Word, which is carried on the breath. God the Father: Speaker/Voice; God the Son, Jesus: the Word, the spoken manifestation; God the Holy Spirit: the breath of life, carrying the Word. Perhaps it is just me, but this thought paints such a beautifully interwoven picture of the intimate involvement of the Triune God in the very act of creation. 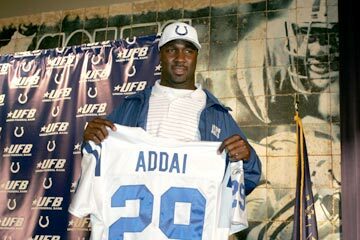 The Colts acquired the 238th overall pick from Tennessee with a trade of their 6th round pick in the 2007 draft. Charlie Johnson, OT, Oklahoma St. NOTE: The Indianapolis Colts have no Round 7 selection in the 2006 draft. The 238th overall pick was traded to Tennessee in a previous trade agreement. NOTE: The Indianapolis Colts had no Round 4 selection in the 2006 draft. The 127th overall pick was traded to Philadelphia in a previous trade agreement. The One Year Bible Blog's commentary for today. 40 But the other criminal rebuked him. "Don't you fear God," he said, "since you are under the same sentence? 41 We are punished justly, for we are getting what our deeds deserve. But this man has done nothing wrong." 42 Then he said, "Jesus, remember me when you come into your kingdom." 43 Jesus answered him, "I tell you the truth, today you will be with me in paradise." This last sentence sometimes perplexed me; Jesus was in the grave for three days, so how could he be with this forgiven criminal in paradise on the day of their death? But then I realized: Jesus was physically in the grave, yet spiritually he never died. He never sinned; therefore, spiritually He remained always alive to God the Father. Since Jesus is God, Jesus is omnipresent, and therefore He indeed was in Paradise with this man! I pray that I have the humility and faith of this condemned man!